Senne, Ann. Protecting The Elderly From Financial Abuse. Financial Advisor Magazine. June 20, 2018. Givens, Orie. Hudson Valley Groups Team Up to Fight Elder Abuse . Spectrum News, Hudson Valley (NY). June 15, 2018. DeMasters, Karen. Elder Abuse Prevention Website Launched for Advisors, Public . Financial Advisor Magazine. June 15, 2018. DeMasters, Karen. 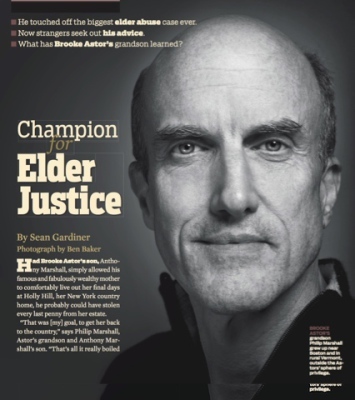 Brooke Astor's Grandson Leads The Elder Justice Fight . Financial Advisor Magazine. May 7, 2018. Lieber, Nick. How Criminals Steal $37 Billion a Year from America’s Elderly. Bloomberg. May 2, 2018. DeMasters, Karen. From Whistle-Blower to Elder Champion . Financial Advisor Magazine . February 2018. McCale, Christina. A Personal Story of Elder Abuse and Advocacy: An interview with Philip Marshall . Justice Clearinghouse. November 16, 2017. Poston, Bruce. Berks County Area Agency on Aging focusing on elder-abuse awareness . Berks & Beyond, June 6, 2017. Bernstein, Jacob. When David Met Brooke: The Ultimate New York Power Couple . The New York Times. March 25, 2017. Plock, Alyssa. The Story of Brooke Astor and Elder Abuse (interview with Liz Loewy and Philip Marshall). Capitol Pressroon, WCNY . March 6, 2017. Price, Margaret. Widespread Elder Fraud Sparks Responses . Investor's Business Daily. February 11, 2017. Interview with Scott Greenberg, host of radio show, Oh My God, I'm Getting Older and So Is My Mom . Episode 222. May 23, 2016. UD hosts Elder Abuse and Exploitation Conference . UDaily, University of Delaware. May 20 , 2016. Arvedlund, Erin E. Watch for signs of financial elder abuse . The Philadelphia Inquirer. April 25, 2016. Hammesfahr, Eric. How Alabama Plans to Defend Elders from Financial Fraud . CQ Roll Call. March 15, 2016. Elder Financial Fraud (webinar: playback or download). CQ Roll Call, Participants: Kathleen Quinn, Execuitve Director, NAPSA ; Judith Shaw, President, NASAA ; Philip C. Marshall; moderated by Eric Hammesfahr. Levits, Jennifer and Anna Prior. Officials Seek Clampdown on Elder Fraud: Growing financial exploitation prompts legislation mandating advisers to report suspected abuse . Wall Street Journal. December 29, 2015. Lentini, Grace. A Declaration of Interdependence: Philip Marshall fights for elder justice one keynote speech at a time . In A World of Knowledge. The Bay Magazine. November 2015. Sullivan, Jennifer Nicole. Confronting the Unthinkable , Newport Mercury, Newport, RI. December 24, 2014. Patricio, Melissa A. Beyond Brooke , RWU magazine, Roger Williams University, Bristol, RI. Fall 2014, pp. 38-47. In the Best Hands?, Inside E Street (2013), AARP, Washington, DC. Conducted May 19; aired June 24, 2010. Interview with Sheilah Kast. Gardiner, Sean. " Champion for Elder Justice,  AARP Bulletin, Washington, DC: AARP, December, 2009, pp. 22, 23, 25. Interview.